Linking Act! CRM with Sage 50, puts your customer and accounting database in a single place –Act! CRM. Designed specifically for Act! by our experienced team of developers at Alphalogix, AlphaLink provides seamless integration between Act! and Sage 50 Accounts. To save your organisation time, minimise duplication of effort and empower your customer facing teams to be more productive. AlphaLink provides full visibility of all customer account information without the need to switch to the Sage 50 application and allows you to check the accounting information for every company in Act! 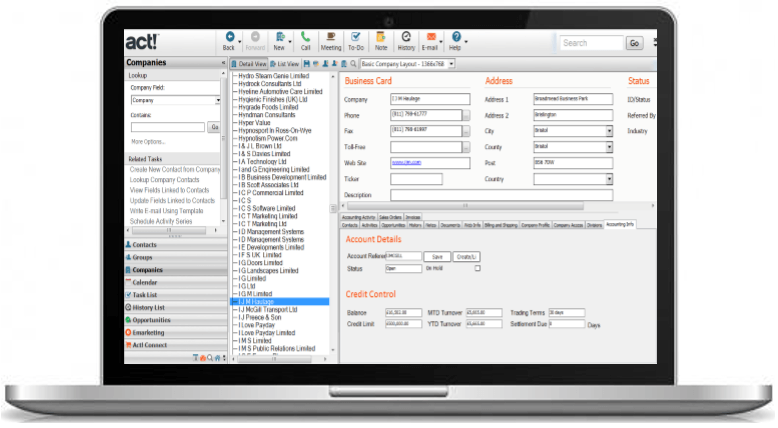 including current Sage 50 account balance, on-hold status, trading terms, credit limits and turnover totals. View a complete trading history within Act! for every customer. View Sales invoices, with drill down facility to check payment status. Create New Sales Orders directly from an Act! quote/Opportunity (for Sage 50 Accounts Professional). View Sales Orders from Sage 50 in Act! you can even drill down to view individual item lines (for Sage 50 Accounts Professional). Import and Synchronise your product list from Sage 50 Accounts to Act! Ensure data integrity between the two systems. Create new Sales Ledger Accounts in Sage from Act! or link to existing records. Update Prices per Opportunity to bring through Customer specific price information from Sage 50. Check Stock levels and product availability in Act! The features available to you in AlphaLink depend on your current version of Sage 50 Accounts, Sales Order Processing functionality is only available in Sage 50 Accounts Professional. Create Sales Orders in Sage Accounts, from Act! The most recent Credit Control balances, accessible from Act! Invoices, Sales Orders and Sales Receipts can all be reviewed from Act! Create Companies in Sage Accounts, from Act! How does Sage 50 Accounts integrate with Act! Once a link is made between a Company or Contact in Act! and a Customer in Sage, the transmission of Company details, Products, Credit Control balances, Invoices, Sales Orders and general accounting activity is seamless.Users can view all of this crucial information from Act! without requiring access to Sage, they don’t even need to have Sage installed on their system! Users will benefit by having access to Sage from the new AlphaLink tabs on your Act! interface.